Lara studies the design of future artificially intelligent buildings to increase efficiency and sustainability. She views the future smart home as one systemic entity that becomes interactive, focusing her research on the intersection of artificial intelligence, architecture, sustainability and biomimicry. Alongside her doctoral research at the GSD, she is involved in materials research for the GSD’s ALivE group and robotics research at the Harvard Microrobotics lab, both affiliated with the Wyss Institute for Biologically Inspired Engineering. 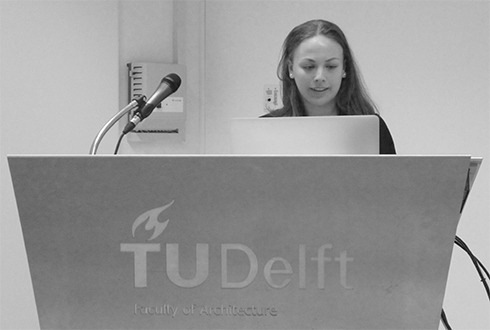 Lara holds a BSc and MSc degree in Architecture, Urbanism and Building Sciences from Delft University of Technology and studied a semester at Polytechnic University of Milan. She participated in multiple projects of The Why Factory (part of MVRDV), a think-tank that researches urban and architectural futures. She worked as an intern at Benthem Crouwel Architects, after which her research and data visualization were presented at the International Architecture Biennale Rotterdam in 2014. Her previous work consists of a wide range of visonary designs and design tools based on diverse issues and developments in the world. Her interests include sustainability, parametric design, biomimicry, robotics, and data visualization.